TNNA feels such a long way away now; I worked my way through the jetlag with a bunch of things for the the Yard (more about that later), and then it was time to trek back to the UK, where I'm now resting up after a bout of gastroenteritis. This is really the first time in the last few weeks I've had time to sit and write about it all! This was my booth this year; I exhibited again with my US distributor Deep South Fibers. After the success of the shelves we built for last years' show, Tom set about building a 2nd set to match. At some point last summer, after the 2012 show, I found some tent poles in a camping shop that *exactly* matched the ones we'd repurposed in the first set, and naturally grabbed them - matching poles on a 2nd set would be a must, really. When we got round to measuring out the poles for the next set we realised I'd messed up - and hadn't bought enough of the new, matching poles. And being in Italy at the time, where having anything shipped costs a small a fortune, we were a bit stumped. Before ordering anything online, we figured we'd try the local Decathlon to see if they had anything close to matching, or at least something reasonable enough in price to replace the poles for both sets of shelves. And there we fell for the super sleek aluminium poles. They were a bit of a hefty dent in the budget, but apart from having them all matching, they looked less like tent poles and weighed 500g less per shelving set. Worth the spend, we thought. They look so much more professional. 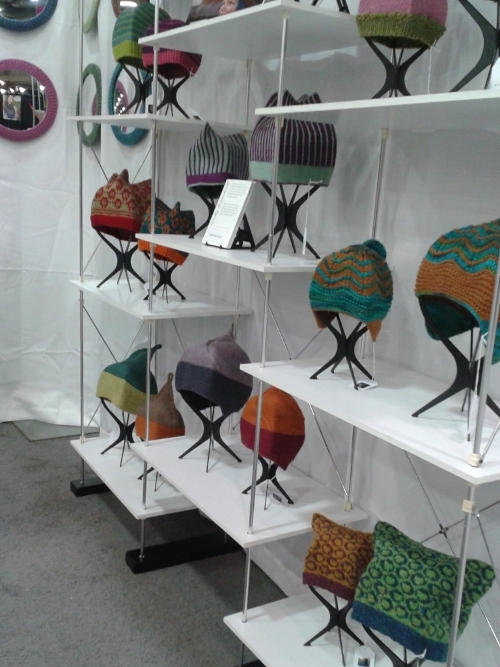 The Playful Woolly Toppers Hats had their own display! The cover banners were printed locally in Italy, and I had a whole bunch of photo ones printed at the same time, which kept the unit price down. I took those with me but it looked too cluttered to have them all up. This is one thing I may rethink for next year - I reckon something more imaginative is in order on the hanging imagery front. That said, these won't be wasted, especially the photo banners. I didn't take with me the circular laminated photos from last year - perhaps that's an idea I can revisit.. maybe have them printed on fabric? The sideways banners were printed at Spoonflower. There's one hanging either side, and they were printed side by side to get the most of the full width of fabric. I then cut them down, overlocked them, added hem pockets, and then they're hung from old tent poles to keep them from curling. They worked out less in price than a printed vinyl banner of the same size, and take up less space and weight in the suitcase. The downside was the shipping from the US, which is neither cheap nor speedy. But still, an overall winner for the effect. The camping table was spot on - just the right size for everything, and could be moved as the mood took me. A lot cheaper than hiring one, and perfect for future shows. It still makes me happy that I can fit all this in my suitcase! Also on the table were a few of the 'in-progress' Hats that I'd put together last year, with hand made black needles to boot (it all has to match, right?). They're pretty handy for showing that I've a variety of Hat construction methods on offer.. think I might make a few more of these for the display materials bank. A closer view of the shelves - here you can see how much smoother the joins are in the tent poles - they don't really look like tent poles! We also improved the cross-brace system, as the method last year for the rear braces wasn't so great. The side braces are pretty much the same, but the rear braces are now more rigid (we had tent poles that went across the back of the entire unit previously, and they did very little to stabilise things!) and that made a big difference. Rachel of Coopknits was my trusty assistant this year, and between us we put these up in no time at all, and they were all perfectly square and level (it also helped that I'd typed out step-by-step instructions for the construction, so that my jet-lagged self would remember). I was much happier with the overall look - the shelves stood by themselves pretty sturdily too, no wobbling, which was a bonus! I'd hired horizontal bars on both booth walls to tie the shelves to, to stop them being knocked over (even when perfectly square and stable, being so lightweight they are easily knocked) but didn't end up using them because they actually didn't need them. They did get knocked at one point, at the base, and apart from a couple of head stands toppling, the whole unit was fine. Quite a result, methinks. I'd say we've got the engineering right now for these. And they definitely look like they've grown up, too, compared to last year. And finally, the little and large head stands. The little ones were 3D printed at Shapeways - these was another big dent in the budget, but totally worth it, as they're something that will be used over and over again. This year was definitely more spendy than last on the display front, although I hired less so overall it wasn't as bad as it could have been. Considering that generally I'm super-thrifty, I think I've finally accepted that it's OK to spend a little on something that I'm going to get multiple uses out of, and on things that help keep the space and weight down for travelling. So, beside the obvious enjoyment in the planning of the space and building nifty stuff for display, how was the rest of the show? The post-TNNA head crash where you wonder-who-the-hell-you-are-trying-to-play-with-the-big-boys happened a good month or so before the show, so I went prepared for the worst. And having an eviction notice arrive two days before flying didn't help either - friends were warned that I might not be the greatest company, especially after a glass of wine or three. My confidence still took a nose dive, but it hasn't hijacked my head like it has in previous years. I totally failed to take any pictures of any social aspect or any other part of the show. I did manage to get a decent amount of sleep - for the first time ever at TNNA - which helped muchly in the prevention of turning into a wreck. I caught up with friends, met loads of friendly new faces, and really enjoyed the social side of things. From that point of view, it was a brilliant show. I do so miss spending time with fibery friends. It was madly busy on saturday and strangely quiet on sunday. I deliberately didn't try to source yarn or make new 'contacts' or try to get work in any other way. Knowing the year we have ahead, the last thing I need is more commitments, and the last thing those companies need is someone who can't keep their commitments. So on that front, it was good too. There will be changes ahead. What they are yet, I don't know. It's all good, I promise!